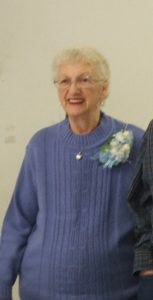 Milly “Sue” Smith, 84, of Kooskia, passed away May 21, 2018 at St. Joseph Regional Medical Center in Lewiston. Sue was born to LeRoy A. and Sarah E. (Howell) Parks on December 29, 1933, in Grangeville, Idaho. She was adopted by Charlie O. Flynn after he and her mother married in 1940. She attended school at Clear Creek, Mt. Idaho, Grangeville and Kooskia. During her childhood, she spent time at her Grandparent Howell’s in Grangeville, where Grand-pa was a Black Smith. During World War II, she enjoyed summers with her mother, who worked for USFS, on Lookout Butte and Middle Butte. She graduated from the 8th grade in Kooskia. In January 1948 she married Lewis N. Lyons. They had three sons, Wilber, Lawrence “Larry”, and Rhondy “Rhon” Lyons. They divorced in 1967. On November 19, 1968 she married John M. Smith in Hellgate County, Missoula, Montana. They enjoyed 49 years together. During these years Sue worked as a restaurant cook, YCC cook, USFS Recreation Guard, Drug Store Clerk, and the entrepreneur of Syringa Sue’s Wild Jellies and Jam. She enjoyed crocheting reading, fishing, hunting, camping, and picking huckleberries and mushrooms. She is survived by her husband John, sons Larry (Jennie) Lyons and Rhon (Sunnie) Lyons. Stepchildren Darrel (Phyllis) Lyons, LeRoy (Marilyn) Lyons, Jack (Dagmar) Smith, and Bonnie Smith Martin. Sue has many grand-children, and great grand-children. She was preceded in death by her son Wilber Lyons, brother Lawrence Lee Parks, parents and 2 grand-children. She loved her family and thought of them first. She gave us many gifts and wonderful memories. At her request, no funeral services will be held.